Urban Safari is a methodology developed for the analysis and design of sidewalks focused on the pedestrian experience. Developed in New York through the “Active Design: Shaping the Sidewalk Experience” study, it was translated and adapted by Cidade Ativa to be applied on Brazilian sidewalks. Conceived as an extension of the”active design” manual, the guide investigated how to encourage walking in cities, starting from the premise that the pedestrian experience when walking on a sidewalk is modeled by a physical space that, in turn, is regulated by policies. As a result, the publication offers a new methodology for surveying sidewalks and synthesizing this data, allowing experiences to be replicated through the regulation and design of its elements. The team in New York tested and improved the original methodology on expeditions called “urban safaris”. Templates guide the elaboration of perspectives but also of technical drawings that help to obtain measurements and quantifications. 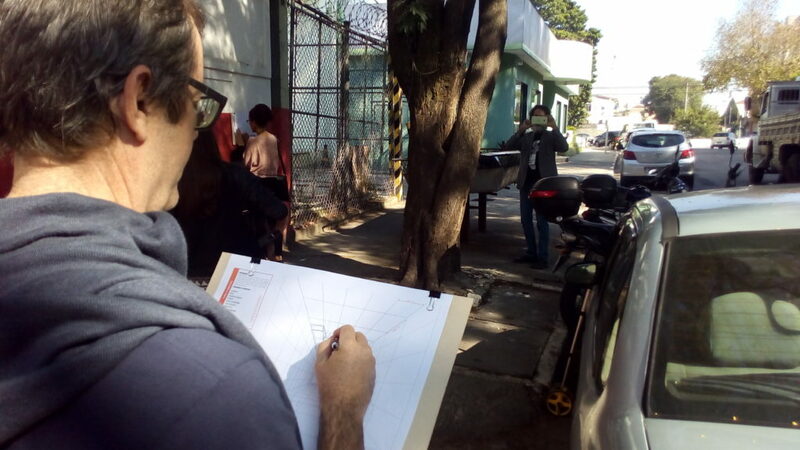 Free hand drawing is the main tool used during surveys and is considered essential for the translation of “experience” or “sensations” pedestrians have while walking. The dissociation of the sidewalk planes, which are drawn separately – road plane, the building, the floor and the roof – enables a more attentive and critical look at the elements that compose them. With the data obtained systematized in spreadsheets and diagrams, it is easy to identify the parameters that make a given sidewalk a good – or bad – reference. This analysis is used for comparing case studies and for identifying opportunities and challenges, as well as for defining guidelines and strategies for improving building new sidewalks.